A video is powerful communication media to convey any information accurately than other sources of media such as Images or audio. This is because images only offer still data, where information should be limited to the frame and with audio format, visual information is not possible. Due to this, Video format connects with most of the audience and hence, is the craze for video albums or movies which is unbeatable by general audio albums. In this era of digital media, the video has been a strong marketing tool for most of the business platforms and companies to advertise their product. Due to the advent of technology, mobile phones and handy gadgets like the tablet has become a common device with everybody. Due to this, it has become easy for people to search and watch videos directly through their mobiles. Online videos have become a new trend due to this reason as people are more into video surfing these days. Online video also became a strong marketing strategy for business to attract customers. Many budding artists and graphic designers are also online video platforms to showcase their talent and get the right opportunities to grow in their business. There are many video hosting sites and video upload sites which help them. But, it is fact that producing video and editing with quality is difficult for small time business or any small time enthusiast as it difficult and expensive. Also, video making sometimes requires serious skills such as screenplay or direction etc. Online video tools help in such cases, which help people to create their video tools providing various video editing tools online. There are many online video making tools and video hosting sites which host these videos. Vimeo is the best youtube alternative and an excellent platform for uploading and hosting videos. Vimeo is one of the top video hosting and video uploading sites which allows for sharing and consuming high-quality videos. It is best suited for people who prefer high-quality videos such as 4k ultra HD videos for collection. Many categories such as short films, journalism videos, animation video, informative collection etc., all are popular categories are available on Vimeo. Founded in 2004, this video hosting platform concentrates more on helping people with more artistic content. In public video uploading sites such as YouTube, due to many competitors, these unique artistic videos may not get attention. Vimeo helps such artistic material providing it more reach as it has few competitors. In short, Vimeo can be considered as a private art gallery with quality videos. Storage and management: Videos with any memory can be uploaded into Vimeo without any problem. Vimeo supports uploading videos from all types of devices which has the capability to host and stream ultra 4k HD videos. It supports HD video share and streaming HD videos. Users can easily manage videos such as organizing videos, sharing and making bulk changes from settings to licensing. Unlike public video platforms, No advertisements are put up on or before video which irritates users sometimes. Also, provides tons of storage which reduces the tension of running out of memory. Post Production and collaboration: Users can share video live for collaborations and to get video review on rough cuts. Also, Vimeo provides password protection for video. This tool allows sharing video workflow with more than 10 people to collaborate in private chat and make necessary improvements to the video. Final Cut Pro helps users to export video in advanced codes for HD video share. Marketing and Monetization: Vimeo helps to engage your video anywhere and sell them worldwide and form a network that follows users’ videos. Users can launch their own subscription network or sell their videos in the global marketplace. They can create embeddable playlists or albums that can be customized to share with the world for showcasing their work. Video players are customizable and hence users can prefer their own tastes. They also have options such as to play in an infinite loop and choose what happens after the video is over. There are lead generation tools such as email marketing integrations and video interaction cards which help users to generate leads. In-depth statistics, track performance and video engagement graphs are available for users to analyze the pulse of the audience. High-quality live streaming: Vimeo live allows users to stream ultra HD 4k videos and HD 1080p videos with their audience. They can stream up to three events simultaneously which helps cover many things at once. Videos can be reviewed and published, edited and replaced as many times required. Users can stream their videos to social media platforms such as Facebook, YouTube along with Vimeo. Vimeo provides very quick support for helping users in their queries to make and share high-quality videos. Web Interface provided by Vimeo is not so grand making it simple and easily usable by newcomers. On top header bar, Vimeo provides options such as Manage videos, Watch, On Demand and Upgrade. On the right-hand side of the interface, user profile portion is present which helps to navigate to users profile quickly. Account settings have many controls such as making basic profile information and updating, setting notification preference and payment management. On the bottom, Do More option is present, which quickly links users to, options such as uploading and organizing videos of users, viewing stats and upgrading the account. Centre console is divided into three tabs namely, My Feed, My Videos, and Trending. My Feed section displays popular videos from categories from any groups or people that are followed by users. My videos section consists of videos uploaded by the user itself. In Trending videos section, videos that are currently popular on the platform are displayed and it is also meant for discovering content on the platform. On the whole, Vimeo video player is simpler and cleaner with large buttons and a black and blue color combination and elements with large default size. Interesting and attractive part of the video player is, it dedicates half of the screen space for the video itself. Main advantage of Vimeo is its, simple and excellent video player. With large buttons great color combination, and providing almost half of screen space for video it gives great watching experience. Another main plus point of Vimeo is that there is no advertisement in the video, and before or after the video is played. Vimeo has great community providing HD video share and hosting videos online. It can also be used for monetization, by selling or renting out videos through Vimeo on Demand option. Videos can be stream live with HD quality even with ultra 4k HD quality. They can be shared privately for collaboration thus allowing users to provide good quality videos with feedback. Provides review option with videos, which allows users to get any reviews or notes or feedback from the viewers or clients. The biggest drawback of Vimeo is most of the services with quality and professional services are required for premium subscriptions. Some of the subscription prices are bit high which makes it some less attractable with common people. Mobile uploads are limited to the Vimeo platform. Though Vimeo provides statistics for users to analyze, the statistics provided are not great when compared to its competitors such as YouTube. Also, the traffic on Vimeo is less when compared to public video uploading and video hosting sites. 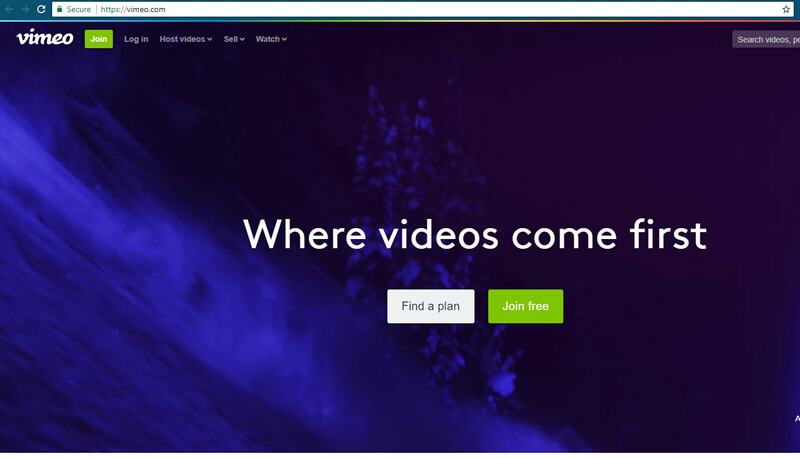 On the whole, if you are an artist or journalist or advertiser or any creative mind who is in search of HD videos share and high-quality content, Vimeo is definitely is the best youtube alternative for you. With HD streaming and quality services, Vimeo can help to create a lot of videos. With more people looking for video creating tools, Vimeo will be best to choose the option with reasonable price and great services.